That's right! 24hrs to get to Paris from London - this is not for the faint hearted. If you've already completed the standard tour or if this is a box you need to tick off you can be certain of an experience of a lifetime (plus bragging rights). This grand 175 mile route from central London to the Eiffel Tower in Paris is a classic, with an Adventure Café twist. Ride from one exciting European capital to another in just two days! Starting from the iconic London landmark that is Big Ben on the strike of 2pm your leader will guide you south through the city and out into the countryside past Sevenoaks, Crowborough and Lewes, before down to the Sussex coast arriving at Newhaven from where we will catch the late night ferry to the french port of Dieppe. Our ride through France takes us through the attractive French countryside. We’ll glimpse poppy fields and charming French villages. We cycle on through the small town of Gournay and then on to our approach to Paris, here we really get going! 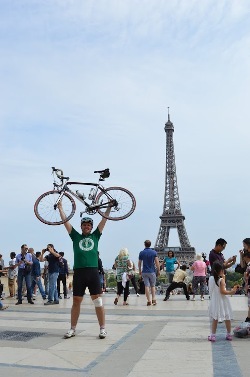 It’s downhill into Central Paris and we’ll eventually pass right beside the impressive Arc de Triomphe and swoop along the grand Champs Elysees to our finish point bang in the middle of the excitement of Paris. From one capital to the other…. The evening is then yours to enjoy; celebrate in this beautiful and culturally vibrant capital. You are accommodated in Paris and the following day (aching legs permitted!) you are free to sample the delights of city before catching the Eurostar train directly back to London. Your bike will have a head start on this journey and you will be reunited back in London. 14:00 - Depart ride on the chime of 2pm from Big Ben, We're off... we travel south into the countryside past Sevenoaks, Crowborough and Lewes, then down to the Sussex coast arriving at Newhaven for 19:30. 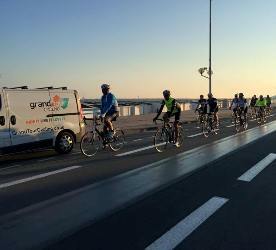 Now the challenge is on, after a quick breakfast, we breakthrough the darkness into the new day on the saddle and with Paris looming on the horizon - try to take in the beautiful countryside as we blast towards the French Capital! We have to make the most of the open roads before entering the outer reaches of the city and of course the Paris traffic. We will stop for lunch on the outskirts of the city. As we near the city centre you will be greeted by all of Paris famous sites such as the Arc De Triomph and the Eiffel Tower. Congratulations you have reached your destination! 10:00 - Checkout of hotel and a brief couple of hours enjoying Paris. **Special Note - The time of departure by Eurostar to London is subject to availability, however, Adventure Café will endevour to meet necessary travel requirements for the trip. Cabins on board the ferry are optional and can be arranged for £25 per person - please let us know at the time of booking if you would like a cabin. Expect warm weather but possibly rainshowers. Expect cool temeratures riding through the small hours into the morning. Plan for these conditions, and if we encounter anything more benign, then that will be a bonus for us! thank you to you both and all of the Adventure Café team for making this so successful!